A storm and cold temperatures combined to create a rare snow-capped Mauna Kea in June. Hail and snow fell on the mountain shutting down summit operations Saturday night as up to eight inches covered the ground. On Sunday crews cleared the roadways, the sun melted some of the snow and access re-opened to the public. Only a few folks ventured up the mountain on a beautiful Sunday to play as observatory work crews kept busy clearing ice and snow from the giant domes so they would be read for night observations. The trip up was accompanied by Dave and a CouchSurfer Grace who decided to tag along for the adventure up top. 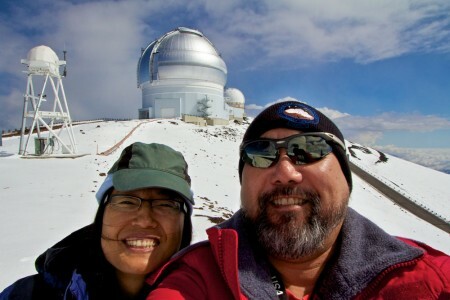 CouchSurfer Grace and me on Mauna Kea with the Gemini telescope behind us. She's in the video with the title saying it's the last bodyboard runs downhill.